ESET NOD32 Antivirus is well-trusted software that offers basic protection against malware, ransomware, spyware, and phishing. The basic product is for Windows but different packages allow for multi-device security including Mac and Android. ESET NOD32 Antivirus is easy to use and install, and won’t slow down your computer. 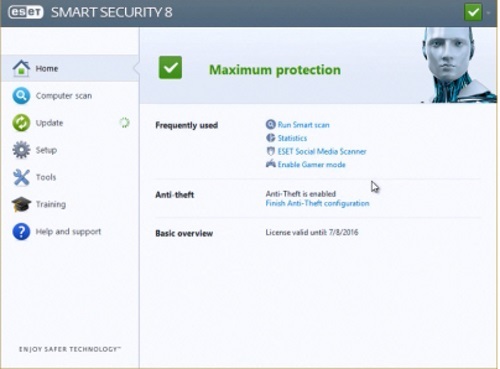 Watch our ESET video review! ESET is a veteran in the world of antivirus software; it is a trusted brand that has won numerous awards, recognitions, and certificates. Its antivirus software delivers efficient and speedy protection, whether you are using a computer for personal use or for business. ESET NOD32 Antivirus offers protection from viruses, malware and spyware while still allowing you to access your usual internet pages, such as online banking, gaming sites and social networks. While ESET’s flagship is its NOD32 Antivirus, the company also offers other products to meet a variety of needs. For example, ESET business solutions provide endpoint security, server security, remote management and more. ESET’s mobile solution offers parental controls, including a web guard, child locator, and more.Whether personal or business, every user can take advantage of ESET’s multi-device security, which offers comprehensive security for PC, Mac, and Android devices. ESET NOD32 Antivirus - This is the basic package that includes protection from viruses, spyware, malware, and ransomware. It is super easy-to-install, and will not interfere with your daily computer use and web surfing. In fact, it allows for such high-speed computer performance that you will probably forget it’s there, unless you see a pop-up reporting that a suspicious website has been blocked. ESET NOD32 Antivirus can be used on up to 3 devices, and can be purchased per year or for 3 years. As ESET is an international company, price will vary depending on location. In the US, a yearly subscription with a CD sells on Amazon for about $35, and a download from the website costs about $40. ESET also offers 3 higher tiers of security: ESET Internet Security, ESET Multi-Device Security, and ESET Smart Premium. ESET Internet Security provides the same high standards of antivirus protection, and also includes safer online banking and shopping, parental controls, and a safer webcam and home router. ESET Multi-Device Security provides the same protection as the Internet Security package, and can be used on all your devices, including PC, Android, Mac, and tablet. ESET Smart Premium provides the entire Internet Security package, with the addition of safely storing your passwords and encrypting your data. In terms of quality, AV-Tests, an independent testing company, tested ESET NOD32 Antivirus in April 2017 and reported 100% protection for widespread malware discovered four weeks prior, and 98% protection against zero-day malware attacks, which are viruses that hackers create to slip through unknown holes in antivirus software. For the sake of comparison, ESET ranked even higher than Norton in this arena. 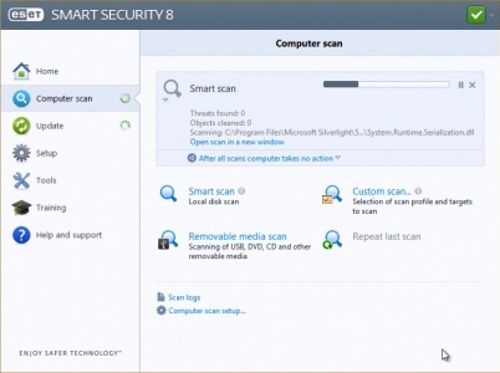 In addition to comprehensive protection, users report that ESET allows their computers to function at normal speed, which is a big advantage in this fast-paced world. ESET NOD32 Antivirus is extremely easy to use. You can purchase a CD to install, but it’s much easier to simply buy online and download directly to your device. Once you run it, a Set-Up Wizard will run prompts to finish the installation - it takes a few clicks, and you’re good to go. Once installed, you can tell at a glance whether or not your computer is protected. If not, the antivirus software will prompt you to address and fix the issue. Even if you’re not the most tech-savvy person, ESET’s antivirus software makes it easy to manage your computer’s security. ESET NOD32 Antivirus costs about the same as other basic antivirus software from other respected names in the industry, such as Norton, Kaspersky, and Bitdefender. It may be a few dollars more or less depending on your location, but the basic price is the same. That means that it’s not the best deal around - but it also means that you’re paying for a premium product. If a product like ESET’s antivirus software sells for less than $30/year, that’s reason enough to beware. Added value to ESET’s antivirus is that you can download a 30-day free trial, which really is free. If you are unhappy with it, you can cancel your subscription before the 30 days are up and you won’t be charged. ESET offers its customers many self-help support tools, such as a searchable FAQ page, a threat encyclopedia, ESET user forum, and support news. To actually contact a support representative, customers need to submit a case via the ESET website or their own personal ESET dashboard. ESET’s video library is particularly helpful and can walk you through all types of situations, such as activating your product, excluding certain files or folders from real-time scanning, removing a detected threat on Facebook, and more. ESET does not offer live chat or telephone support at this time. However, its email support and Help pages exist in a number of different languages, making it accessible to customers in the 202 countries in which ESET products are used. ESET is easy to download, install, and manage. Once installed, it is barely noticeable - which speaks to its quality. In other words, it doesn’t slow down normal computer operations, and doesn’t have ads or pop-ups - unless it’s a notification that something suspicious has been blocked. All in all, ESET manages to keep abreast of the latest security threats, and thwart them. ESET NOD32 Antivirus comes from a company with a long history of quality products - and more importantly it offers nearly 100% protection against malware, viruses and identity theft. 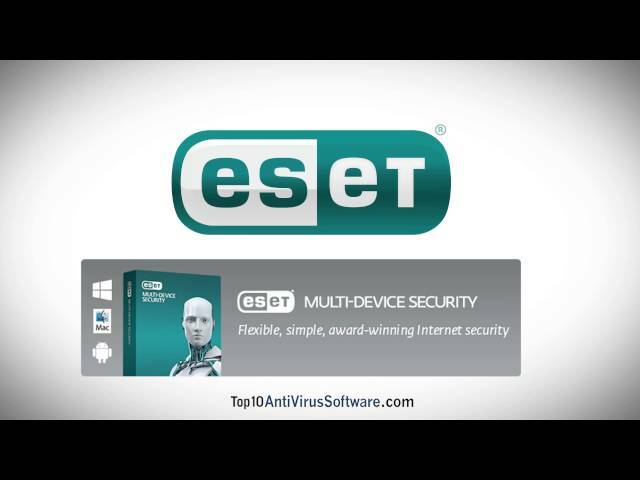 The software is ideally meant to be used with a Windows operating system, but ESET’s Multi-Device Security package, enables consumers to add the antivirus to any other devices. The software itself is easy to install, use, manage, and maintain. The pricing is standard within the industry and need not act as a deterrent or incentive when deciding whether to purchase the product. ESET was founded in the former Czechoslovakia in 1992 by Miroslav Trnka and Peter Pasko, the original creators of the NOD antivirus software package. Since then, ESET has expanded internationally and has opened offices in California, Argentina, Singapore, Montreal, and Germany. Throughout its history, ESET has garnered multiple international awards and set many records, such as the Péter Szor Award for uncovering Operation Windigo and also becoming the first to break the magical 100 VB100 awards threshold. In addition to its basic antivirus software, ESET offers a wide range of security solutions for both home and mobile users, as well as businesses.